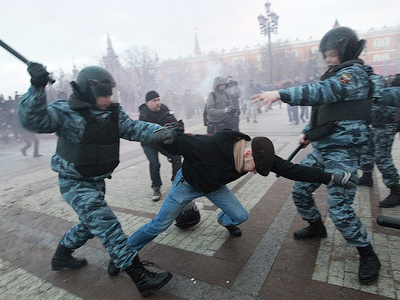 Two activists of the unregistered Other Russia party have been detained in Moscow on suspicion of involvement in the violent mass protests in Manezh Square last December, according to its executive committee member Aleksandr Averin. ­Averin said that criminal cases have been launched against Kirill Unchuk and Ruslan Khubaev who have been charged with inciting national hatred, mass disturbance, and disorderly conduct. He added that the detentions took place late Wednesday evening; however there has been no confirmation from law-enforcement bodies so far. The Other Russia party, headed by opposition leader Eduard Limonov, was founded in June last year but was refused registration by authorities because of its extremist and nationalist ideology. Limonov has repeatedly dismissed accusations of nationalism, saying that the party’s program “is neither left nor right” and that its aim is the social good of the people. 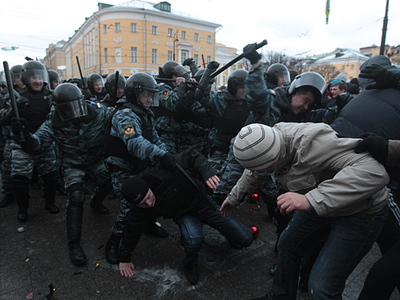 The notorious mass brawl in Manezh Square in the very center of Moscow broke out on December 11. 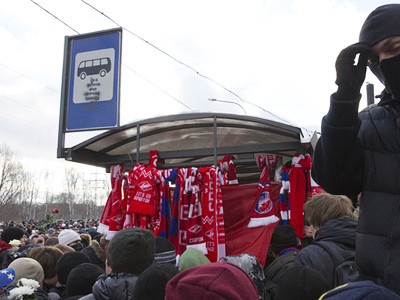 Initially the rally was meant to commemorate the death of football fan Egor Sviridov, killed by natives of the North Caucausus. 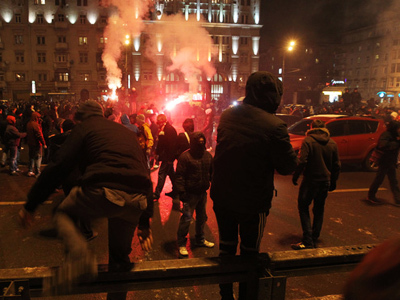 Inflamed by nationalist slogans, the gathering turned violent and was suppressed by the police. Since then an investigation into the incident has been ongoing. At the same time, investigation into the death of Egor Sviridov is also continuing. Five suspects have been arrested. One of them, Aslan Cherkesov has been charged with murder, while the others are accused of inflicting serious injuries and disorderly conduct.